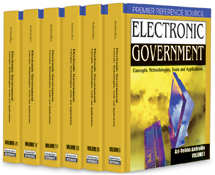 Electronic government is developing throughout Europe. Increasingly, central, regional, and local governments use ICT applications to perform their tasks. In the 1970s and 1980s, computers were mainly used to perform administrative tasks (including word processing). In the 1990s, juridical expert systems were introduced within government organizations: software programs which can solve juridical problems, either without any human interference or with limited human interference, by means of a reasoning mechanism and a “knowledge database” (Groothuis, 2004). Furthermore, government agencies started to use new ICT applications such as the Internet and e-mail to communicate electronically with citizens. This article examines the juridical aspects of automatic decision making and electronic communication by government agencies in The Netherlands and addresses the following questions: 1. What is the legal framework for automatic decision-making by government agencies in The Netherlands? 2. What is the juridical quality of decisions made by expert systems in practice? 3. What is the legal framework for electronic communication between government agencies and citizens in The Netherlands? 4. To what extent does electronic government exist in The Netherlands and what are its prospects for the period 2005-2007?